We are back for another Back to Basics blog hop today! 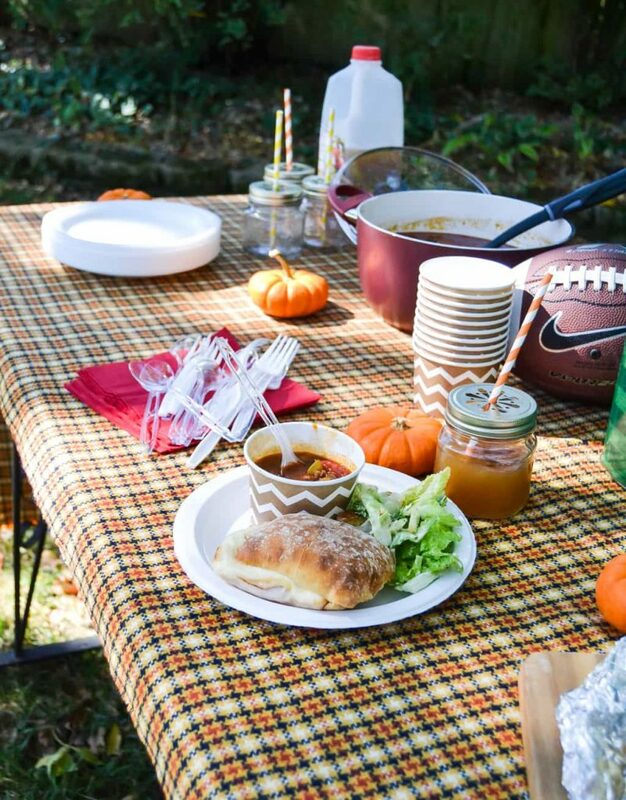 We are talking about fall picnic and tailgating tips that will make your outdoor soiree easy and stress-free. I love picnics because dining alfresco is always fun. Not only do I like that the mess stays outdoors, but there is something about stepping out of the daily routine that makes a meal outside exciting. The great thing about a fall picnic is the weather. There is no better time of year to have a picnic in my opinion. The leaf colors, the cool air and the fall scents always set a beautiful tone for a picnic. If you are having a fall picnic in national park or just in your back yard, I am sharing 10 tips that will make it easy and successful. 1. 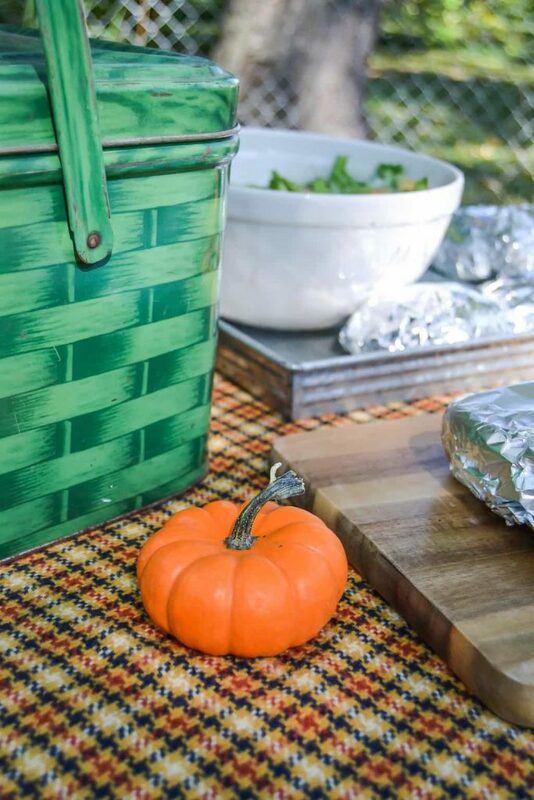 Check the Forecast: The biggest problem that would hinder any fall picnic is the weather. You can’t change it so make sure to check the forecast and schedule accordingly. 2. 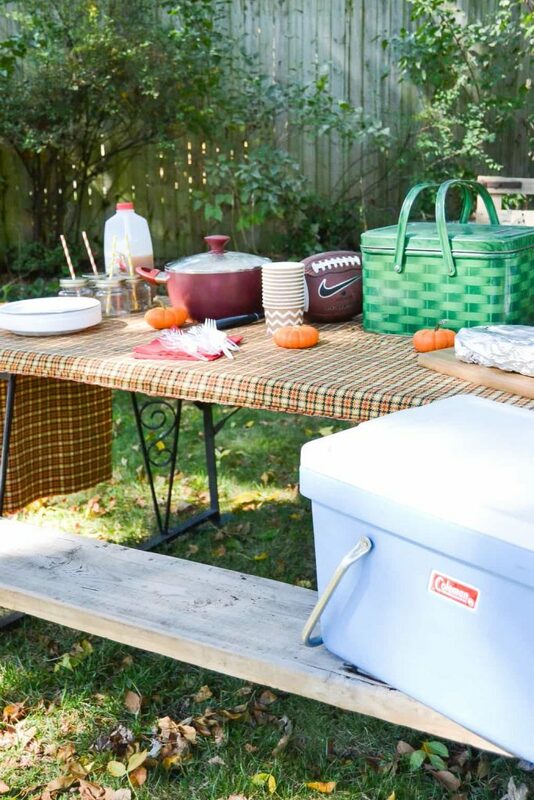 Pick The Perfect Spot: You don’t even have to leave your yard for a fall picnic. No matter where you are planning the picnic, pick a flat spot that has plenty of room to move around. A shady spot is also a good idea so the sun isn’t beating down on you or the food. 3. Plan The Menu: Make it simple! Keep the food easy and simple. Choose fall foods that your family loves and food that is easy to eat and handle. 4. Prepare The Food Ahead Of Time: Prepare everything that you can ahead of time. That way, when it is time to get the picnic basket packed, it is waiting for you. 5. Bring Wipes/Cloths: Picnics can get messy so pack wipes/napkins/cloths for hands, faces and picnic tables if you are going to use them. 6. Pack Something To Sit On: If you aren’t using picnic tables, don’t forget to pack something for everybody to sit on. A big blanket is nice, but you could also use beach towels or lawn chairs if you have them. 7. Bring Games: One of our favorite things to do during picnics is to play lawn games and/or catch. Make sure there is enough for everybody to join in and a variety so no one gets bored. 8. Pack Extra Blankets: A fall picnic can get chilly (that’s what I love about it) so make sure to pack extra blankets, jackets and sweatshirts. 9. Utensils: As you are packing the picnic basket with the food, pack the utensils you will need at the same time. Packing a salad? Pack the serving utensils and eating utensils you need for the salad next. That way, you will not forget anything you will need to serve and eat the food you bring. Do you love eating outdoors in the fall? What is your favorite picnic food? Shop these items to make your fall picnic a huge success! « DIY Painted Buffet Makeover – Making It Pretty Again! Hey Lindsay! 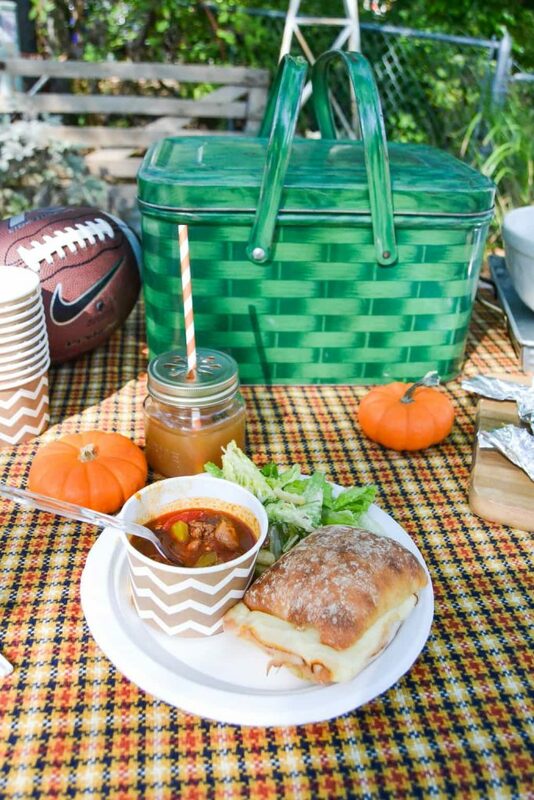 Your picnic ideas are perfect for Fall. We had to laugh about the extra food – we hide our favorite treats just in case we run out of anything else LOL. 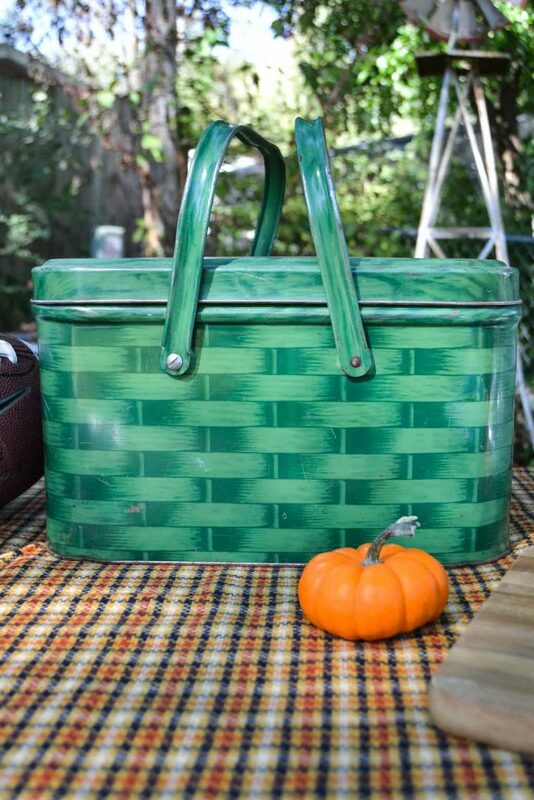 Love the vintage tin picnic tote…great find! Dreaming about the perfect picnic! Great and useful tips! Thanks! Hi Lindsay……You have created a perfect picnic setting. This makes me want to plan my own picnic before it turns to cold. Thanks for sharing. Hi Lindsay, these are some really awesome tips for a summer evening picnic with the family. Just thinking about it brings a smile, thanks. Thank you! So excited to be able to eat outside again! These tips are really helpful for my next picnic trip. Thanks for sharing.